Augusta City Hall is located at 16 Cony Street, Augusta ME 04330; phone: 207-626-2310. Photo: Tappan-Viles House, ca. 1816, 154 State Street, Augusta, ME. Listed on the National Register of Historic Places in 1982. Photographed by User:John Phelan (own work), 2013, [cc-by-3.0 (creativecommons.org/licenses/by/3.0)], via Wikimedia Commons, accessed March, 2014. Augusta in the nineteenth century was a small commercial center on the Kennebec River which then, as now, was important chiefly as the location of the Maine State Capitol, the State Insane Asylum, and the Kennebec County Seat. A United States Arsenal was also located here until 1905. Notwithstanding its central location, the city did not develop a large industrial base, the textile mill at the head of Water Street being a notable exception. Augusta's small commercial district, concentrated almost entirely along the Kennebec River, is locally important as the focus of retail activity and meeting halls for the publicly-owned institutions which dominate the community. The historic resources of Augusta's central business district include all of the important surviving commercial buildings and fraternal halls which have not been significantly altered. Although founded in the 18th century, Augusta's development did not really get underway until the state capitol was established here in 1832. In addition to state government, the city quickly became the location for the state mental hospital, a Federal arsenal and the county seat. All of these institutions constructed substantial structures which are extant and listed in the National Register of Historic Places. The city's commercial district developed along the Kennebec River both to the north and south sides of Bridge Street, which linked both banks of the river. Water Street's location, laid out in 1785 across the river from Fort Western (1754), was a logical choice due to the terrain. Although Augusta was the farthest point up-river which could be reached by the maritime trade, and the railroad arrived in 1851, the state capitol did not develop as an important commercial or industrial center. Only the establishment of a publishing industry, beginning in 1872, first under E. C. Allen and latter under William and Guy Gannett and Peleg Vickery, earned Augusta a national reputation. Allen was particularly important as the first to utilize mail-order extensively. Although Allen constructed three large blocks on Water Street, all have been extensively altered. The Vickery Block has already been listed in the National Register. The most prosperous period of development for the central business district was the third quarter of the nineteenth century when the Italianate style predominated. This was in part due to a major fire in September, 1865, which leveled much of the commercial district south of Bridge Street. The Williams Block (183-187 Water Street) is the only surviving element which pre-dates this conflagration. The rebuilding which followed included many fine Italianate blocks erected between 1865-1880. Many were designed either by Francis Fassett of Portland or John C. Tibbetts of Augusta. 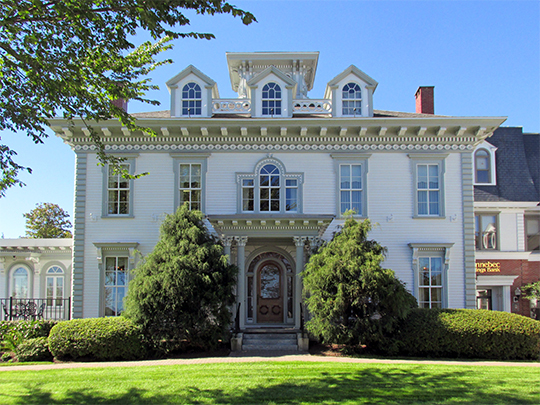 Much of Fasset's work has been altered or destroyed, but the Whitehouse Block (188 Water Street) can be attributed to that major Maine architect. Tibbetts, the most important designer produced by Augusta, is responsible for the Noble, Sturgis and Haskall Blocks (180-186 Water Street). Important additions to the south end of Water Street did not occur until the end of the century with the erection of the United States Post Office and Courthouse in 1889-90 (N.R. ), the Doughty Block in 1890 by local architect Charles Fletcher (265 Water Street), the Masonic Hall in 1894 (313-321 Water Street) and the Vickery Block in 1895 (N.R. ), both by Boston architect John C. Spofford, and the Journal Building in 1899 by local architect Arthur Wing (325-331 Water Street). The early twentieth century saw the construction of two important department stores which marked the street's peak as a commercial center. The first is the Bussell and Weston Store, constructed in 1909 (190 Water Street), which is one of the very few buildings constructed in Maine as a department store in the first quarter of this century. The second, S. S. Kresge's (241-249 Water Street), is distinguished as a rare example of Moderne style design. Post-World War II developments were characterized by a declining commercial base and substantial demolitions of historic structures. The loss of historic structures through destruction and demolition has left the business district with no potential for an historic district. Reed, Roger G., Maine Historic Preservation Commission, Multiple Resources of Augusta's Central Business District, nomination document, 1986, National Park Service, National Register of Historic Places, Washington, D.C.